12 years ago, on May 13th, 2005, I decided to start the NosillaCast. Somewhere along the lines I met the wonderful Bart Busschots and he started to be a regular on the show, in a segment we affectionately called Chit Chat Across the Pond. Bart and I talked about photography and security and Macs and just about everything geeky that interested us. Eventually we started doing Chit Chat Across the Pond together every other week and on the opposite weeks I’d have other tech guests on the show. Bart started his own shows, Let’s Talk Apple and Let’s Talk Photography. In April of 2013, Bart decided to start a sub-series of Chit Chat Across the Pond called Taming the Terminal. This was the beginning of what we like to call our “propeller beanie” shows, where we get real geeky and learn how to conquer some of the harder tech topics. After a while, it felt like Chit Chat Across the Pond was ready to stand on its own as a podcast. It started to feel weird to tell guests to tell their fans, “fast forward to 38 min and 12 seconds in the NosillaCast to get to Chit Chat Across the Pond where I’m on.” So in October of 2015, the Chit Chat Across the Pond podcast was born. It wasn’t a coincidence that October of 2015 was when we pretty much wrapped up Taming the Terminal. When I spun off Chit Chat Across the Pond into its own show, Bart and I and Steve worked together to produce a complete set of Taming the Terminal episodes as its own podcast. Odd way to back into it but it’s such a great body of evergreen material we wanted it to have its own place in the podcast world. Now that we’d tamed the Terminal, Bart decided it was time to help me make one of my retirement dreams come true: to learn how to program. In October 2015, he started the series Programming By Stealth, still within Chit Chat Across the Pond. I enjoy the heck out of it and while I do complain to the teacher quite often that it’s too hard, Bart recentlysaid my programming muscles are actually getting toned and some day I’ll have a programming six pack! I have to say though that it’s been feeling weird to me to have this very uneven show. One week I rib Chris Ashley about the new education laptops from Microsoft being just like netbooks, the next week we’re learning how to access html attributes with jQuery, the following week we learn about how accessibility affects design of tech, and the next week we learn the box model and how to affect it using Cascading Style Sheets. See what I mean? It’s a roller coaster. In anticipation of the site redesign, I started marking the heavy lifting episodes with a category of Programming By Stealth, and the easier on the brain ones with Chit Chat Across the Pond Lite. I even designed a new logo (by typing “Lite” on the Chit Chat Across the Pond logo). When the new site went live, I put in place a way to view the Chit Chat Across the Pond lite, and Programming By Stealth and full Chit Chat Across the Pond series on their own web pages, but they were still all one giant, ungainly podcast. I’ve been wondering for a long time what affect this has on all of you. I figure there’s three types of Chit Chat Across the Pond listeners. Some of you listen to all of Chit Chat Across the Pond. Some of you probably listen to just the lite episodes and some listen to just the Programming By Stealth shows. It’s got to be annoying to have to check each week to see if it’s your kind of show. I started noodling, what if I could make feeds for every type of person? My goal was to see if I could easily have three feeds for Chit Chat Across the Pond; one with all episodes, one with just the lite episodes, and one with the more propeller beanie episodes. One major requirement: it had to be easy for me to maintain. This week I figured out how to do it! Since this is a geek show, I’ll walk you how I made it happen. 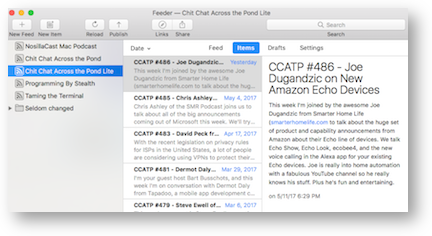 The hero of the story is the amazing tool I use to create the podcast feed. It’s called Feeder, and it’s by Steve Harris of reinventedsoftware.com. A podcast feed is made up of a bunch of stock information that doesn’t change, like the podcast logo, the description, the iTunes and RSS meta data. Then inside a feed are what are called items, which are the individual episodes with their descriptions, titles, and links to the audio or video files. So I’ve got a podcast feed for CCATP, but it has in it all of the heavy and light episodes. In Feeder, I created a new feed called Programming By Stealth. Then I flipped over to the original Chit Chat Across the Pond feed, and did a search for the words “Programming By Stealth”. That filtered the list down to just the PBS episodes. Ready for the trick? I dragged those 35 episodes from the CCATP feed to the PBS feed, and Feeder made a copy of them! It was glorious when I realized it would be that easy! I spent some time stripping the CCATP moniker off of the titles and standardizing them to say PBS and the episode number, but that only took a few minutes. Feeder even kept the original publishing dates so the feed stayed beautifully in order. I added the PBS logo, created a name and place on my server for the feed file and it was done. Ok that was easy, but how do I create the CCATP Lite feed? The episodes were never created with that in the name. Again, Feeder to the rescue. I realized that I could copy all of the CCATP episodes over, then search within the new Lite feed for the PBS episodes, and just delete them. Boom, the Chit Chat Across the Pond Lite feed was born. So now going forward, we have to rely on me remembering a pretty simple step. Let’s say I’m creating an episode of Chit Chat Across the Pond that will be a Lite episode. I create it in the Chit Chat Across the Pond feed. Then I simply drag it into the Lite feed and I hit publish on both feeds. Same thing with a PBS version of Chit Chat Across the Pond. I create it in CCATP, then drag a copy over to the PBS feed, clean the title to just show PBS. Easy peasy, if I remember to do it of course. I was pretty pleased with how easily all of that worked out. Next I needed official, iTunes-approved logos. Every so often Apple, in their infinite wisdom, increases the size requirements for the logos. In the dark ages they only had to be 300px square, but now since they may show up on the big screen via an Apple TV, they insist on 1400px square. In the old days I created the logos as pixel art, which meant every time a new size requirement came out I had to recreate the artwork. The solution is to use vector art instead of pixel art. All I had from Bart was the pixel art he’d given me for PBS. I opened it up in Affinity Designer, the new vector program from the fine folks who brought us Affinity Photo. I was able, with my very limited skill set (and some help from Allister Jenks across the pond) to reproduce his adorable little alien between squirrely brackets. Once it was vector art I was able to export to any size I liked, including a 1400px square png. The Chit Chat Across the Pond Lite logo was a bit easier because Terry Austin had created it for me in a vector art program from the Mac App Store app called Logoist. It’s a cool program but I wanted to work in Affinity Designer. I opened the CCATP Lite logo in Logoist, exported it as an SVG (standard vector format), opened in Affinity Designer which worked perfectly, and exported it to 1400px as a png. I added the new artwork to the two feeds, and published the feeds to my website. I’ve submitted both shows to iTunes but it takes a couple of days for them to approve a new podcast. Until they’re in iTunes, they probably won’t show up in other podcatchers. Now I’m in the process of modifying podfeet.com. I’ve already changed what happens when you tap on the Programming By Stealth logo on the home page. Now you’ll see a few words on top explaining what Programming By Stealth is, you’ll see the logo, you’ll see how to subscribe to just that show. After a break you’ll see each of the episodes with a player; The Chit Chat Across the Pond Lite one is a bit trickier, mostly because the show notes are a bit longer and I have to get that text formatted so you’ll like it. I’m having a blast learning how to make this work though. The “subscribe to the podcasts” page also desperately needs to be updated (even the new NosillaCast logo isn’t in there yet). Don’t tell Bart, but it’s actually a table, and we learned in Programming By Stealth ages ago that tables are really only for tabular data. The fun part is fixing that will let me use some of my html and css chops I’ve learned in Programming By Stealth! I hope this doesn’t cause any chaos for you. The main thing to know is that if you want to stick with the entire Chit Chat Across the Pond podcasts, both lite and propeller beanie, you don’t have to do a thing. But if you’d rather have a bit more freedom to listen to just what you want, which is pretty much the whole reason podcasts exist, now you can do it! Thanks Alison this is exactly what I was after and I’ve just subscribed to PBS with my propeller beanie firmly planted on my head. Regarding copying and renaming the shows each week surely Hazel could do this for you automatically, all you’d have to do is tag the new episode with either CCATPLite or PBS and Hazel could do the rest. Yay! Glad it makes you happy. I had a feeling.